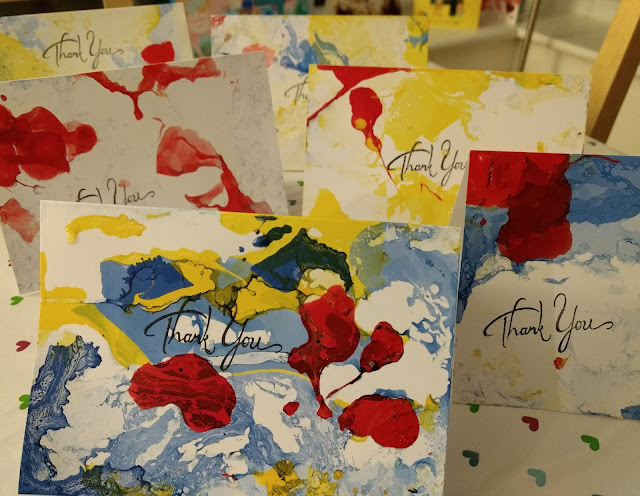 Having failed to post about the thank you cards we made after Christmas (which were inspired by a punched paper thank you card I saw on the Hobbycraft blog) we are now onto the production of thank you cards for the kind and generous people who have spoilt Jessica rotten for her fourth birthday. This afternoon we opted to do some marbling on our cards, which we haven't done for a while. Unfortunately my marbling inks are past their best by some margin so our colour palette was very restricted and I don't think we'll be able to use the red again either but hey ho. Jess enjoys the marbling process very much so these were both fun and fast to make. Once the cards had dried she stamped the message on each one.